I was not present this past Saturday afternoon when answered prayer was celebrated in the White House. 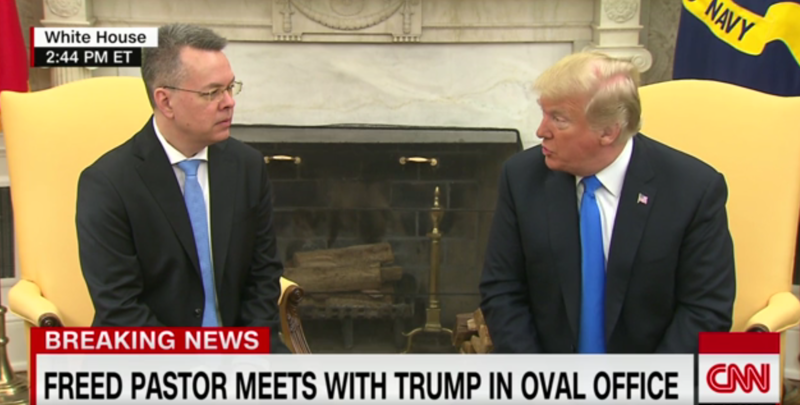 However, because of live television, I watched Pastor Andrew Brunson, in the presence of the President of the United States, openly and unashamedly proclaim that his freedom from Turkish imprisonment of two years is the result of answered prayer. Members of the cabinet, United States Senate, and United States House of Representatives celebrated the power of answered prayer before the world via television. This open celebration resulted in Pastor Brunson and his wife both praying for President Donald Trump before the entire world. The power of Jesus Christ was lifted up, the name of Jesus was proclaimed, and expressions of Christ and His message were proclaimed across the world from America. Dear Friends, let’s not shy away from this moment, but celebrate it. Let’s see this great moment as a major victory for international religious freedom and as a moment to bring our nation together. This is not about political parties in this moment of history, but the people of the world being able to worship God without the threat of abuse or persecution. Let’s not shy away from this moment, but celebrate it. However, we cannot ignore this reality: We are in this moment because President Trump and his administration have stood strong for religious freedom internationally. Their words have made great advances to specific actions that reaped results for the benefit of the world. For this, I am grateful. From 1,183 miles away from the White House in Washington, DC, sitting in our home in Springdale, Arkansas, we celebrated this great moment for religious freedom. We believe God answers prayer. When God answers prayer, we celebrate. I celebrate personally as a Christian. As a pastor of a local church, I celebrate with my Cross Church family publicly. And as the President of the National Day of Prayer Task Force, I celebrate nationally and internationally with all Christians across the entire world. When God answers prayer, we celebrate.